This is GSoC log#04 (view log#03 here). 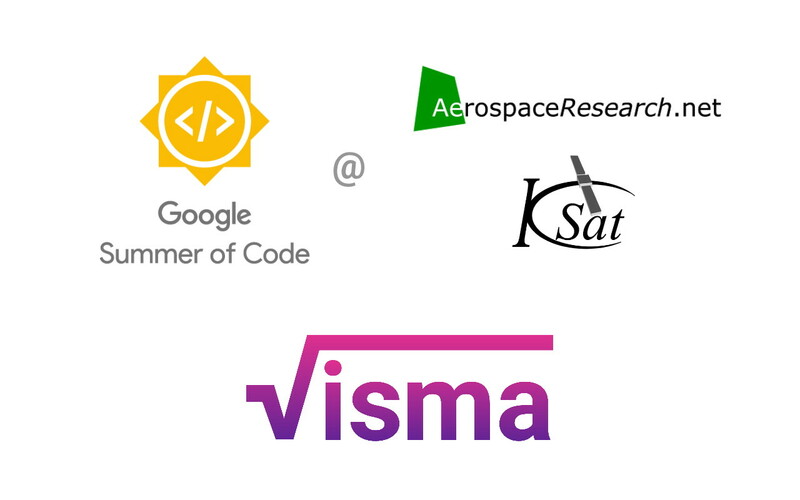 Here I will cover on what I have done in week #08-09 and a gist of what has been accomplished in Phase II coding period and what is to be done in the final coding period. About the Author: Hello guys, I am Aakash Deep. I am an undergraduate student from Indraprastha Institute of Information Technology, Delhi (IIIT-D) in Computer Science and Engineering (CSE). I am a speed-cuber and, my hobby is solving Rubik's Cube. The post is in the continuation of the series of posts from the past. You can access those post in the following links, blog1 and blog2. The database was created for this, a code was written initDatabase.py. The code is responsible for creating a database with all the necessary tables in the database. The database is maintained by the script scraper.py. The script updates tables of the database. The propagation model is implemented. For this, the SGP4 algorithm is used. The algorithm is computing state vectors (a pair of position vector and velocity vector) from the TLE. The Gibb’s method is implemented. It takes three position vectors as input and after computation gives one position vector and one velocity vector (both as combined also known as a state vector) as output. The OOP concepts are used in the implementation of Gibb’s method. The code is in gibbsMethod.py. By using OOP concepts it supports data abstraction and data encapsulation. For input, a file is used from /example_data. It contains four attributes which are time, x coordinate, y coordinate and z coordinate. These are the position coordinates at that particular time epoch. As the file contains a lot of position vectors (8000 to be precise), a set of consecutive 3 vectors are used at a time for gibb’s method. Then for the next iteration, the first vector is removed and a new third vector is added to the set. As we are computing state vectors from a set of three vectors, it is obvious that the number of output state vectors is two less than the input position vectors. So, a vector is created by taking the previous length into consideration which holds all the output state vectors. The class also contains a function orbital_elements which converts these state vectors into the orbital elements. The propagation model, SGP4 is also improved. Previously, the output is not making much sense but after revising it now the velocity vector is making sense. The output of the position vector is coming out to be constant for all the output state vector. Working on position vector in order to get a good output. Many modern communication systems are moving away from traditional analog communication methods to digital communication systems. Using a digital system makes the communication more robust, however will make the system complicated. In this blog we will look at the PSK (Phase shift keying) modulation, specifically QPSK and BPSK. During these weeks, I worked towards implementing Gauss method for preliminary orbit determination using only angle measurements of a celestial body, either for Sun-centered (heliocentric, e.g., asteroids, comets, planets) or Earth-centered (geocentric, e.g. artificial satellites, space debris) orbits. Gauss method is able to take, for a given celestial object, only three pairs of right-ascension and declination observations, as seen from the surface of Earth, and compute an orbit from only those three observations. In order to implement Gauss method, I followed closely the text from Howard D. Curtis, „Orbital Mechanics for Engineering Students“, specially section 5.10. For more details about the math behind the method, the reader is referred to this book. and the output of this function is the cartesian position r2 = [x,y,z] and the cartesian velocity v2 = [u,v,w] of the object, at exactly the time of the second observation. The output of Gauss method depends crucially on finding the real, positive roots of an 8-th order univariate polynomial, which is solved by means of Newton’s method in the book; we tested this using scipy.optimize.newton, but we actually obtained better numerical stability using numpy.roots, which allows to obtain the roots of an univariate polynomial of arbitrary finite order. One drawback of this method is that, in case of obtaining more than one real, positive roots to the polynomial, then one has to choose manually the root which corresponds to the physical motion of the object. But once the adequate root has been chosen, then the Gauss method gives a very good first estimate of the orbit. Also, the output from the Gauss method may be refined; this involves computing iteratively better and better estimates of the Lagrange functions associated to the cartesian states at the first and third observations, in terms of the cartesian state at the second observation. Again, following the text from the book, we were able to implement the iterative refinement procedure for Gauss method. In order to test our code, we followed step-by-step the Examples 5.11 and 5.12 from the „Orbital Mechanics…“ book by H.D. Curtis. In the figure above, we show a comparison of the numbers we get for each of the quoted variables in the book, for each stage of the refinement iterative procedure for Gauss method. Although some small differences appear, eventually after about 15 to 20 iterations, our code shows convergence up to the precision of 64-bit floating point arithmetic. In the figure below, we show (black) the elliptic orbit corresponding to the output of Gauss method, for the observational data given in Example 5.11 from the book. 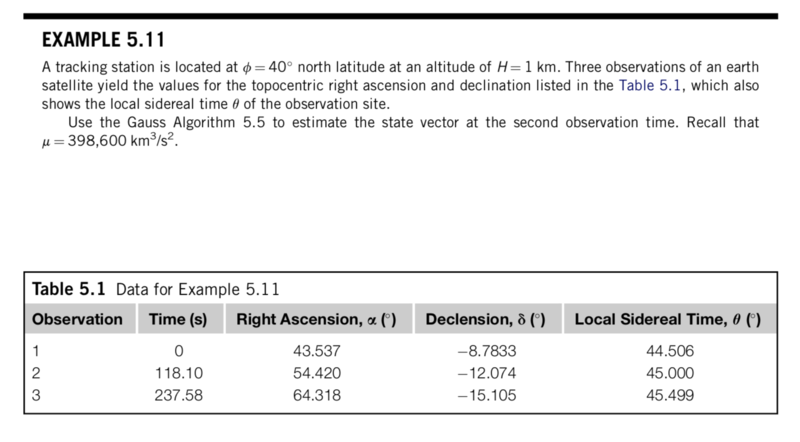 The „Observer 1“, etc., lines correspond to the geocentric position of the observer on the surface of the Earth; „LOS 1“, etc., correspond to the line-of-sight vectors from the observer to the satellite defined by the RA-dec observations. The orange, black and brown lines correspond to the geocentric cartesian states of the satellite at the time of each observation, computed by means of the Gauss method. 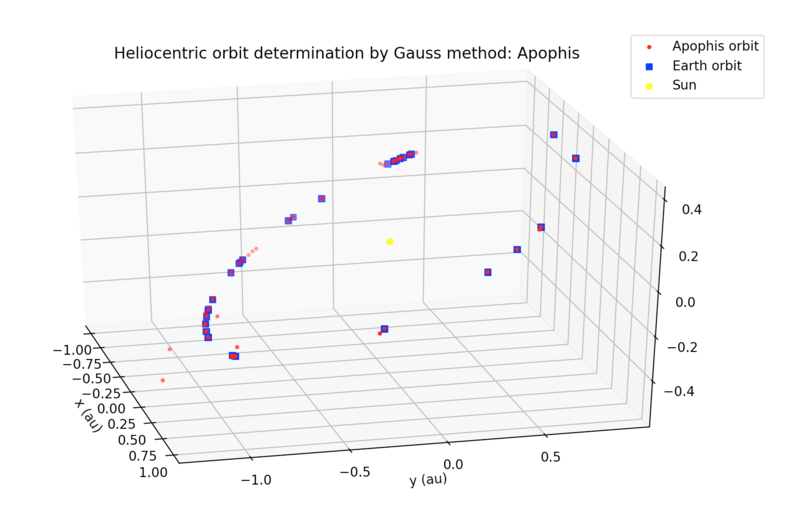 As a second test for our implementation of Gauss method, we took the observational data from the Minor Planet Center (MPC) for asteroid 99942 Apophis, which is a Near-Earth asteroid (NEA). Some differences with respect to Earth-centered orbits are: instead of km for length units and seconds for time units, it is better to use au (astronomical units) and SI days as length and time units, respectively. Besides, instead of the mass parameter μ=G*m for the Earth, we must use the Sun’s mass parameter (in au³ day¯² units). But one of the main differences of Sun-centered orbits with respect to the Earth-centered orbits, is that in order to compute the position of an observer on the surface of the Earth with respect to the center of the Sun, we must know in advance the position of the center of the Earth with respecto the center of the Sun. In order to achieve this, the Python package jplephem was used, which allow us to retrieve the cartesian state of the center of the Earth wrt to the center of the Sun using the NASA-JPL DE430 planetary and ephemerides. Since the orbit of this asteroid suffers perturbations from the planets, as well as non-gravitational perturbations (e.g., Yarkovsky effect), then a direct application of Gauss method gives only a preliminary estimation of its orbit. 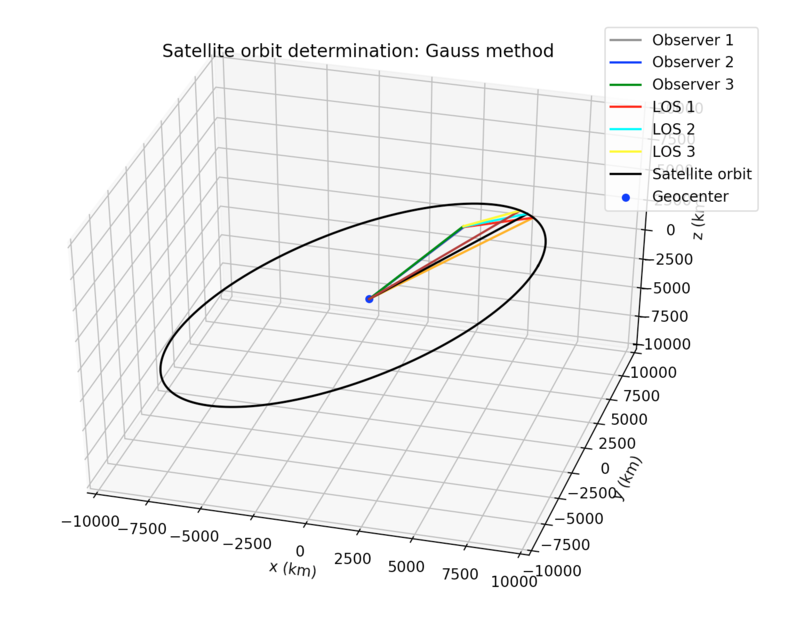 In order to compute a more accurate orbit, this method has to be combined with other orbit determination methods (e.g., least-squares, etc.). This week I worked on propagating the satellite state. The NORAD TLEs are supposed to be used with the SGP4 propagator. It takes care of major perturbations like the oblateness of the Earth and atmospheric drag. Right now, Aakash is working on making one for our organization. But until then, I decided to work with the SGP4 module by Brandon Rhodes. I checked and saw that the module only accepts TLEs as input. So we have to convert r,v to keplerian elements. Then artificially generate a TLE and input it to the module. The Celestrak website specifically asks us not to do this. But when data is not available, one must make approximations. I followed this approach and made the function successfully. However, I wasn’t satisfied. Artificially generating TLEs (which are strings) is computationally expensive. I wanted a direct way to feed the input. So I studied the source code and made another function that does the job without resorting to strings. The first line has constants which have default values. whichconst is the gravity model which is wgs72 by default. And afspc_mode is False unless you are dealing with old TLEs. The second line has paramters that can be set directly from keplerian elements. The elements in order are inclination, longitude of ascending node, eccentricity, argument of periapsis, mean anomaly and number of orbits in a day. The third line has parameters which are available in TLEs but they are not available to us. I set satnum, ndot and nddot to 0. satnum is irrelevant for the calculation. And ndot and nddot are normally very close to 0. For the bstar term, I couldn’t set it to zero because that would disable drag simulation. So I went through the b* terms of many satellites and got an average value of b* = 0.21109x10-4. Unless a b* term is supplied, this is used for the simulation. The last line has parameters related to the epoch. These paramters in order are epoch year, day of year, julian date of epoch, and a Python datetime object of the epoch. These can be set by converting the epoch into a datetime object and manipulating it. Until the real DGSN comes online, we must work with a simulator. A live simulator will also allow us to make live predictions of the satellite. I thought that just running the propagator in an infinite loop will do the job. But it turned out to be more difficult. In a real time infinite loop, I can’t pause to take input. So I can’t control it while it’s running (like stopping or resuming it). Therefore I resorted to multi-threading. The main thread is used for controlling the program and calculations are done on another thread. First, I made a basic simulator. It just prints the current location of any satellite, given it’s state at some previous time. There is a speed setting for development purposes too. The demo below is printing the position of the ISS every second in cartesian coordinates. Next step was to add noise and gaps. 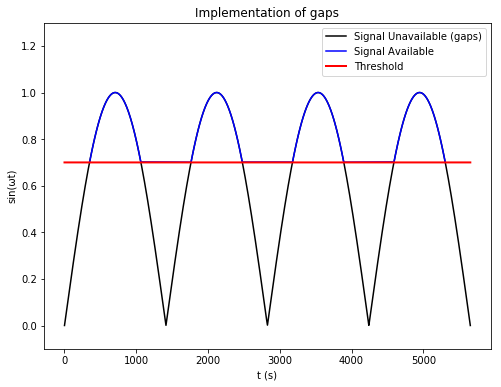 Gaps are periods when no signal is available from the satellite. Adding noise was very easy. A random value between -15 and 15 kms is added to every component of the position vector. To add randomness in time, the time period between each observation is randomly decided. Implementing gaps was tougher. By changing omega, one can control the frequency of the gaps. By changing threshold, one can control the duration of the gaps. A lower threshold means smaller gaps and vice-versa. In my last blog we were at a point where we were able to detect the sync locations in NOAA signal. In this blog, we will look at how the image is extracted and corrected. We will also have a brief look over the AFSK1200 decoder implemented by Andreas Hornig. This is GSoC log#02 (view log#01 here). Here I will cover on what I have done in week #03-05 and a gist of what has been accomplished in Phase I coding period. Created parser.py which handles conversion of tokens to LaTeX or strings and vice-versa. Integrated the differentiation.py and integration.py to the project along with the step-by-step explanation. Support for partial differentiation and „partial integration“ was added. The code was again refactored to decrease complexity and remove unused modules. Added factorize.py module. Can currently factorize polynomials. In my last blog the process of accurately extracting sync locations within the NOAA APT signal was explored. In this blog, I would like to extend the comparison of the two methods that were implemented. Then look at how the process is influenced by presence of noise, sample drops and doppler effect. We got important stuff done in weeks 3 and 4. Everybody knows that visuals and graphics are very important for presentation purposes. The most popular library for plotting is matplotlib. It can generate excellent plots but in the end, they are static images. Instead of static images it’s better if some interactive content is presented. So we decided to make a webapp for OrbitDeterminator. A webapp makes it easier for the end-user to run the program. It can also be hosted on a publicly-accessible server, which means that anyone can use it without going through the pain of downloading and installing the program. For making the webapp, my mentor Alexandros suggested the excellent Dash library by Plotly. Dash is a Python library that can be used to make web applications. The library is built to be hosted on a server and be used by multiple people at once. It is powered by Plotly which produces beautiful, interactive plots in the browser itself. Programming in Dash is simple. First, you have to define the layout of the app in the form of a list of html components. You can style them as you like or add additional parameters. After this, you have to define callback functions. These functions will be triggered whenever the user interacts with the UI (like pressing a button, or typing some text). These functions can be used to change the elements displayed on the app. This makes the app interactive. All the plots are interactive. You can zoom, pan, and rotate them. You can also save any plot you want as a png file. Most of the plots were straightforward. The most difficult plot was the ground track, whose algorithm I will discuss below. To plot the ground track, we have to know the position of the satellite with respect to the Earth’s surface. First, I thought that just converting the coordinates into polar form and plotting φ vs θ would do the job. But I forgot that the satellite coordinates were measured with respect to an inertial (fixed) reference frame, whereas the Earth’s surface is rotating. So the actual coordinates will be different. I went through two articles on CelesTrak and Astronomy StackExchange to come up with the algorithm. NORAD uses True Equator Mean Equinox (TEME) reference frame for its TLEs. In this frame, the origin is at the Earth’s centre. The z-axis points toward the North Pole. The x-axis points to the vernal equinox. And the y-axis completes the right-handed coordinate system. We need to convert coordinates in TEME to an Earth-Centered-Eath-Fixed (ECEF) reference frame. In such a frame, the origin is at the Earth’s centre and the the coordinate axes are fixed to the Earth’s surface (which means that they rotate along with the Earth). Many such frames exist but the standard one is the International Terrestrial Reference Frame (ITRF). In this frame, the z-axis points toward the North Pole, the x-axis points toward 0°E 0°N. And the y-axis completes the coordinate system. Since both TEME and ITRF share a common z-axis, the latitude will not be affected. Only the longitude will be shifted by a certain amount. This amount, known as the Earth Rotation Angle, is the angle between TEME’s x-axis and ITRF’s x-axis. Now I will write down the pseudocode I used to determine this angle. After getting the rotation angle, we can subtract it from θ to get the actual longitude. Putting everything together , we get this plot of the ISS for 21st May 2018 18:27:54 UTC. I used this NASA website to generate the NASA ISS plot. 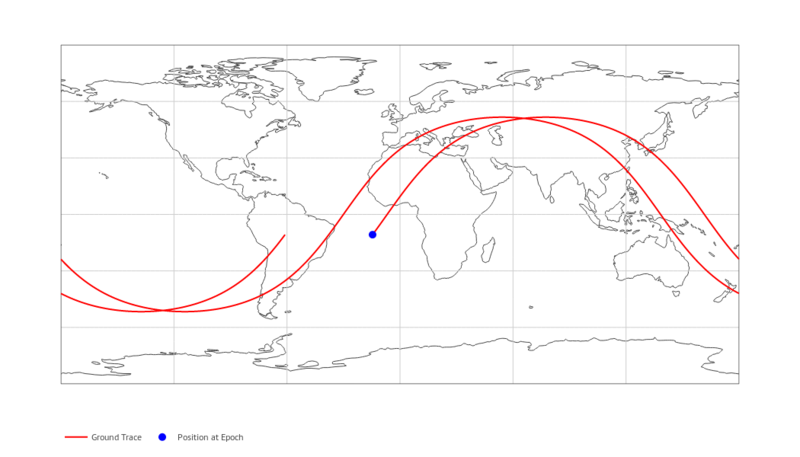 Ground Track of the ISS as generated by NASA. As you can see, the results line up pretty well. Note that this is a simplified model and is not super-accurate, but it gives roughly the same results. Integrating the SGP4 model into OrbitDeterminator. Making a DGSN simulator (this will be used until the real DGSN starts working). Making a Kalman filter to combine the two sources of data.